I will keep this short and sweet, well probably NOT sweet which is probably because I’m very irritated. Just today, I found 3 people on GoodReads whose taste in books felt similar to mine and I thought I could just add them as friends. But I got really irritated when they asked me to answer a question to just add them. Come on, guys, you’re not celebrities that you have to make people answer questions to be-friend you. If you don’t want to add the person in return, just don’t. What are your top 10 books of all time and why? Tell me what do you think of the modern classics re-telling in 5 sentences is infuriating. I will NOT add you, my time and friends list is as precious as yours. “I hate these questions, just tell me something you want me to know about you. But it has to be something “. This is a great question because I can answer it in a simple short sentence or I can elaborate if I want to. That way it isn’t infuriating. May be I’m not making any sense and maybe none of you really mind. If anyone of you already on my friends list has had a question, it means I LOVE you and your question didn’t irritate me. I simply don’t add people whose questions I don’t like. I’ll probably regret posting this later but for now I have to vent somewhere. Sorry for neglecting my blog lately but I simply don’t feel like writing reviews lately but I will probably be back in a few days. I came back from my month-long vacation in India on 5th Nov itself but I’ve been so lethargic after coming back. It took me 1 week only to unpack. I have also been looking for another job since my old job contract got over but it being year-end and all job requirements are few. Anyway enough of that. I have been reading lot, mostly YA. I hope I’ll review almost all if not all the books I’ve read. I have started reading Mockingjay now and I loved the previous 2 books. I have around 5-6 review copies but I’m in the mood to read something other than that but hopefully will be able to finish them soon too. How was the October Readathon? I really wanted to take part but I was home at that time so couldn’t. Hope you all had fun. I had a nice break from my blog which sometimes is necessary. Even after I came back I thought I’ll start blogging only when I feel like it. And now I’m completely refreshed and realized I miss my blog and bloggers. So here I am. That said I’m kind of bored of my blog theme. Do you think I should change it? I guess that’s enough for now. I have a couple of reviews in drafts which will be up soon which will give me some time to finish up the reviews for the new books I’ve read. How have you’ll been? Diwali Holidays and a whole lot of random stuff!!! My job contract with the company I was working with ended in September and since then I’ve had some time on my hands to read, blog and do other things. But mostly I find myself doing is watching YouTube videos and catching up on all the chick flick movies. I have been a little better at reading and blogging too I think. I finished The Hunger Games 2 days back and absolutely loved it. I cannot wait to read the next 2 books. I have already ordered Mockingjay and will be buying Catching Fire once I reach Mumbai because it so happens that Landmark has a sale that will go on till the end of October and since Landmark is my most favorite bookstore and their sale my most favorite sale ever. I can’t wait. We are leaving on 8th October, we’ll be spending some time in Mumbai and then at my home in Pune. I cannot wait to meet my family and friends and spend time in my favorite city. I can’t wait to shop too without feeling guilty about spending too much. I am yet to start packing which I happen to hate. Since we also have a lot of Diwali gifts to carry back home I’m not sure how I will fit everything else. So not looking forward to it. Me and my husband celebrated my birthday on 5th October. 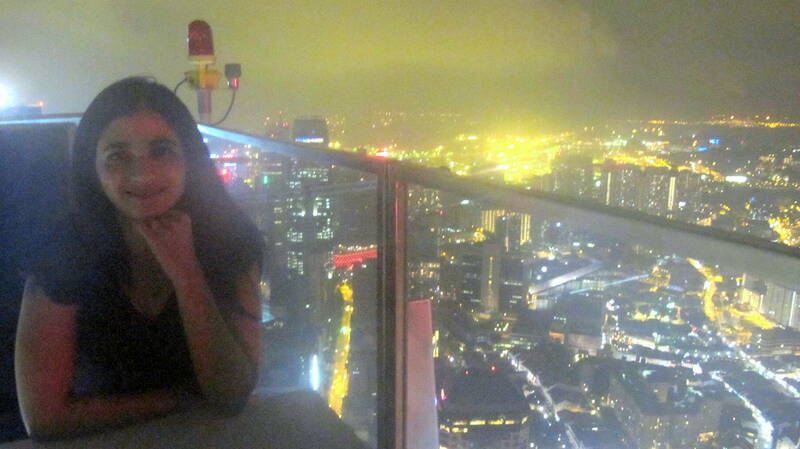 We went to 1-Altitute for Dinner and drinks which happens to be the world or Asia’s highest Al Fresco Bar. 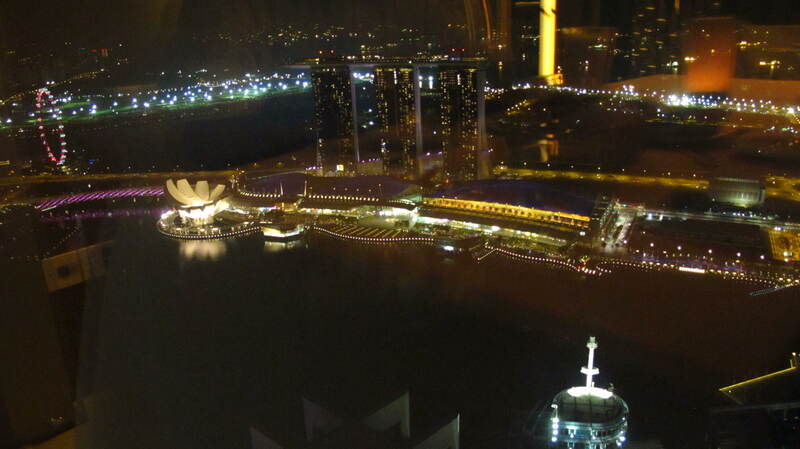 It’s on the 62nd floor and the view is awesome. My husband also bought me a book and a bookmark. He wanted to buy more but I don’t shop books for full price in Singapore. They are way too expensive. But I have been searching this book for some time and glad I found it. I’ve tried to finish all the review copies I have before leaving but I still have 3-4 books left and I don’t think I can finish reading any by tomorrow. So I’m not going to stress myself over it. I’ll just finish them when I come back. I wont have internet access till 26th while I’m at my mother-in-laws place but I do have a connection when I go to my parents place. I don’t think I will blog but I will definitely reply to all the emails and stuff. Sorry for the poor quality of the photos. My Camera is usually very good but I don’t know what went wrong this time. Since I have been absent for some time (again), I thought I shall write an update post, not that is of any interest to you but it makes me feel as if I’m not ignoring my blog as much. So here we go with the tiny details of my life which is probably of no interest to anyone else whatsoever. –I have joined Aerobics class on every Wednesday which is good since it’s also encouraged me to exercise every other day as well. I go jogging or do Power Yoga, power yoga mostly because I can do it at home. 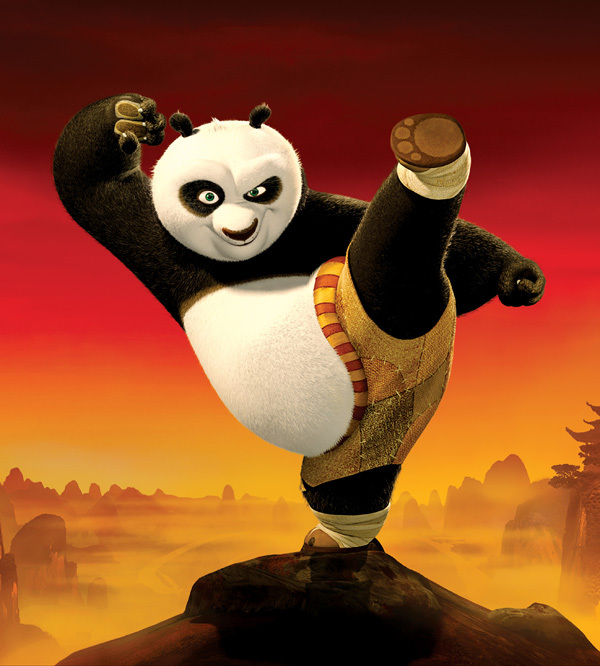 –I know I’m late but Kung Fu Panda was super fun, so was Delhi Belly. I need to watch Harry Potter though. –We are going to Phuket, Thailand in August during the National Holiday week and I’m already excited. Let me know if you’ve been there, I would love to know what places are not to be missed. –I’ve read really good books these past couple of months but haven’t got time to blog about them all. I also read The Graveyard Book (finally!) and love it. –I’ve been missing home a lot lately, home meaning Pune in India. But I can only go in October during Diwali, hope it comes soon. –I’ve found new girlfriends at work and we have a lot of fun. Every girls needs good girlfriends and considering I have very few friends here, it makes me very happy. –Have you checked out Google+? What do you think? I don’t find it very different from Facebook. –I have this intense urge to visit the library since I haven’t got time to do that since a long time. I need to get lost in rows and rows of ceiling to floor books, hoping I get time to go this weekend. That’s the library I go to in the picture below. –I’m reading The Good Muslim by Tahmima Anam which takes place after the Bangladesh war of Independence. It’s good so far and I hope I like it as much as the first book A Golden Age. What are you reading at the moment? –Work has reduced drastically, so I might have more time for blogging. The only problem is I can’t blog from work because most of the sites are blocked here including WordPress. I’m hoping to dedicate some time on the weekends. Anyway, enough about me. How have you all been??? -> My joining date for the new job got postponed by a week. So I’ll be joining on 14th Feb instead of 7th. Fine by me, I get one more week to watch back to back movies and read and laze around the whole day. -> I’ve put on a little weight and most of my old formal clothes don’t fit me anymore. I have to shop for new ones. I hate shopping for a purpose, in my experience you don’t find anything if you’re actually looking for it. -> We spent 3 out of 4 days long weekend in Batam Island, Indonesia. Nothing to do there other than play golf (which I am not very fond of, but my husband loves) and shop. -> I painted our bedroom walls from Red to faint pink today. Who paints all the walls red anyway? -> I am reading 2 books at the moment-Muslim Women Reformers and Sea. Both are good but I’m enjoying Muslim Woman Reformers more. 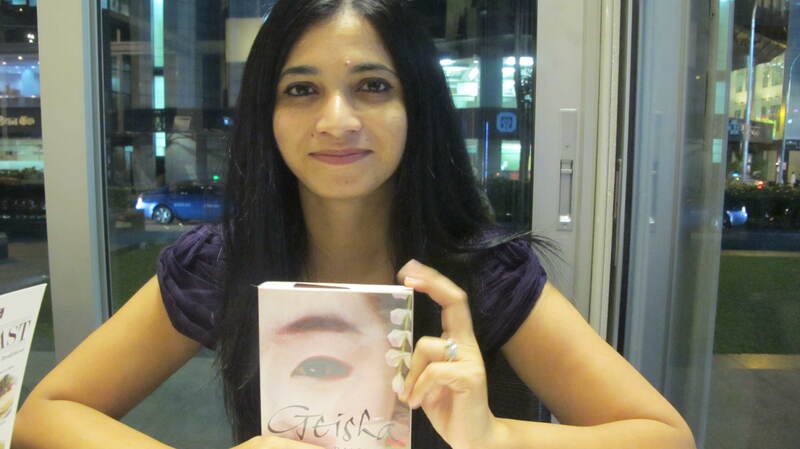 -> My husband has gone to Bangladesh for a business trip and I’ve asked him to get some books by Bangladeshi authors, I’m curious to see what he gets. -> We saw The Mechanic, The Green Hornet and Yamla Pagla Deewana. The Mechanic was okay but I loved The Green Hornet. My husband loved YMD but I didn’t like it so much. I like Kulraj Randhawa though, so it was tolerable. -> It was raining non-stop, pouring actually, in Singapore last week. This week the skies are clear though. I hope it doesn’t rain next week, I would hate if it rained on the first day of my job. -> I’m watching Grey’s Anatomy back to back lately. I’m on the third season now and I absolutely LOVE the show. I don’t think I’ve been that obsessed with any show ever. That’s all for the updates. I like doing these because it kind of clears my mind. What are you people upto? Seems like a long time since I have done one of those. I have been reading a lot since I still don’t have a job. It’s the first time in 4 years that I am home doing nothing. Not even 4 years, in fact for the first time in my life considering I joined my first job immediately after my Post Grad exams. It’s definitely not a good feeling. We are going to India in November for 10 days to celebrate Diwali with family, husband’s as well as mine. It should be fun. My parents and younger sister are coming to Singapore in December for a trip and we’re planning on places to visit and things to do. I can’t wait. I finished my first audio book. I will tell you all about it later. As you all know readathon is near and although I wanted to participate I can’t. My husband is going to Jordan on 12th and I want to spend these couple of days with him. I will pop in to comment and cheer unofficially though if I get the chance. All the best to those who are taking part. Have fun!!! Our lease for the house is ending in November and we spent a lot of time looking for a house. Prices have gone up so much since the last year that we were afraid we would not find a descent house in our budget. But we did find one at the last moment and I cannot wait to shift in after we come back from our Diwali holiday. Oh and we watched quite a few movies. I loved Dabangg. Such an awesome movie. Although I don’t like Salman I think he did a great job in this movie. We also saw Wall Street. I kind of slept for 20 mins or so. Don’t blame me, the movie was sooo boring. I want to watch that animation movie featuring Owls, sorry can’t recall the name. I will drag my husband to it. My husband gifted me a new camera, Cannon G11, for my Birthday (5th Oct). I love taking photographs and I love my new camera. It’s awesome. 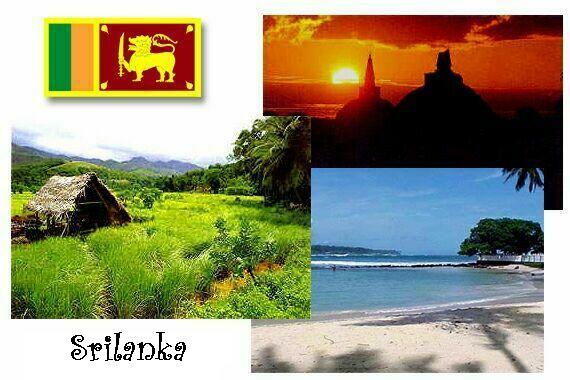 Yup, I am going to Srilanka tomorrow for 17 days, yay!!! I’m so excited. I’ve never been to Srilanka in spite of it’s proximity to India. I admit it was really never in my places to visit someday but as I have been finding out more about the country via the internet, I can’t help but get excited. The thing is my husband is going on a business trip and since I still don’t have a job :(, I decided to accompany him. I really don’t know whether I would be able to access the internet. Yes, the hotel will provide it but since it’s a 5 star hotel, the rates are going to be very high. I’m just hoping I find a net cafe close by to continue blogging. But if not, I will just have to take an involuntary break. To be frank I don’t feel like taking a break because I had a weeks break when I was sick and since I don’t have a job, blogging does not burn me out. I have started rambling again. Anyway, if anyone has been to Srilanka before or know anything about the place, please do let me know what places I should not miss out on. I have got a few mails over the past one year asking me for pointers on Indian movies. I thought why not do a post? When I think of Indian movies the first thing that comes to my mind is songs and dances. The second thing is melodrama. But the recent trend is mostly making the movies more Hollywood style to appeal to the younger generation who watch a lot of American and British movies and think all this dancing and singing is plain stupid. I read a comment once from a British guy who said Indian movies are for the illiterate and semi illiterate. I got so angry at that comment that I wanted to tell him what an ignorant fool he was. The main purpose of Indian movies is to entertain and make you forget all your worries. It works for some and doesn’t for others. So before I digress any further let me give you a list of movies which I feel you could watch as an introduction to Bollywood. All the movies below are cross over movie, made mainly keeping in mind the huge NRI (non-resident Indians) audience, but they are also a great introduction to Indian movies because they are in English and you don’t have to take help from the subtitles to understand them. 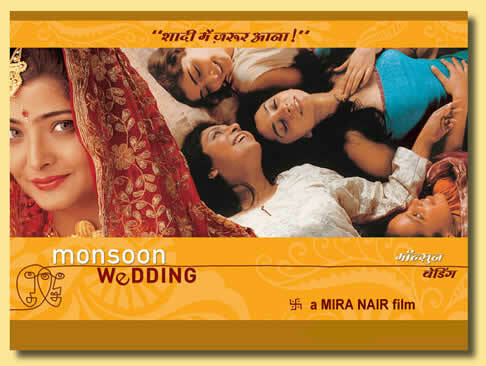 First up is my all time favorite Monsoon Wedding directed by Mira Nair. I love this movie and I’ve watched it countless number of times. It’s a family saga that enfolds during a wedding, where past secrets tumble out of the closet. 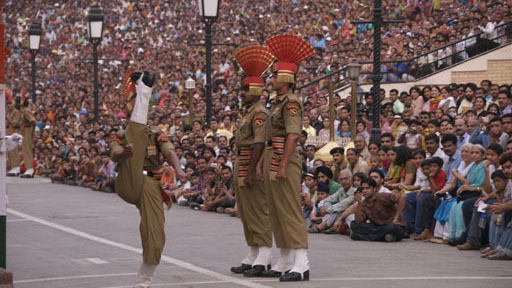 A few songs, dances and a typical North Indian wedding is what you get here. 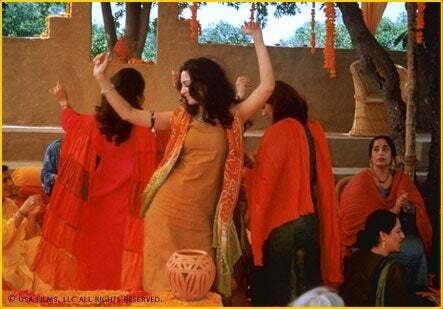 Monsoon wedding is strong on plot as well as entertainment. Watch the trailer here. Next up is Bend it like Beckham directed by Gurinder Chadha. I wouldn’t call this a typical Indian movie, but it’s a great cross over film. It stars Keira Knightley and Jonathan Rhys Meyers as the supporting cast and it revolves around an Indian girl Jess (Parmider Nagra) who wants to break the mold of a traditional and conservative family and play football instead of getting married. It’s a fun movie and probably a little less bollywood types. Watch the trailer here. 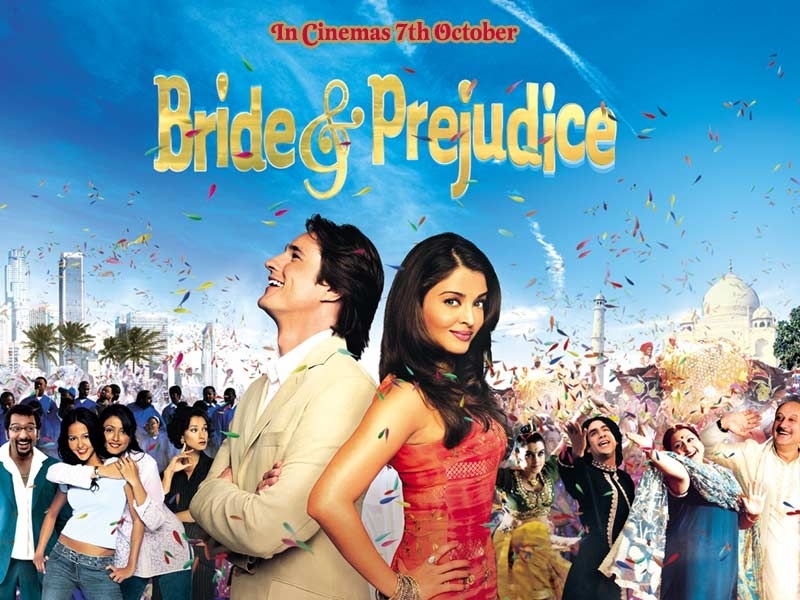 The last movie I want to highlight is Bride and Prejudice also by Gurinder Chadha. I recently saw this movie again on the Telly and I was reminded of it again when I read Beth’s post on Pride and Prejudice adaptations. This movie is not an adaptation but is an Indianized version of P&P. With lots of songs and dances, this movie is thoroughly entertaining. One thing to note while watching an Indian movie is not to think too much and simply enjoy the vibrant colors and dances. Also, they do get cheesy at times; just remember to take it with a pinch of salt. If you don’t like musicals, you would most probably not like Indian movies. 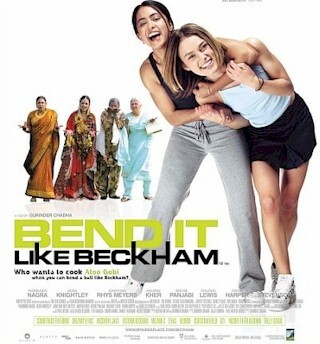 Bend it like Beckham is likable though because it does not have any songs as such. Watch the trailer here. That’s it for now I guess. For non-Indian folks, have you watched any of these movies? Or have you ever watched an Indian movie before? For Indian folks, which one is your favorite? Can you list any other cross-over movies? Let me interrupt the normal proceedings of my blog to introduce you to someone, in case you haven’t seen him before. Why is he in the spotlight today? I mean have you seen this guy talk? Or walk? Or laugh? Well, you get the point. In case you don’t watch Nat ional Geographic, he is the host of Don’t tell my mother in which he shoots in places that are considered to be dangerous. Places like Pakistan, Bosnia, Iran, Afghanistan, North Korea and so many others. I started watching the show because I really liked how different it was from the other travel shows. You see things that you didn’t know existed. I mean really, it would be worth getting Cable just to watch this show. Well, I wouldn’t say I liked him instantly. I used to watch this series and then gradually started noticing how witty, smart, intelligent, charming and dashing this guy is. 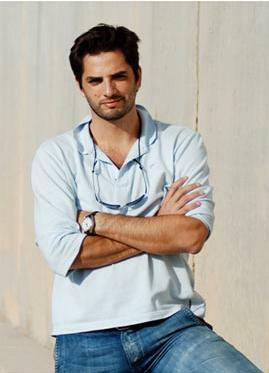 Here is Diego Bunuel’s profile (from Wikipedia, in case you are too lazy like me to click on links). I think it’s really impressive. 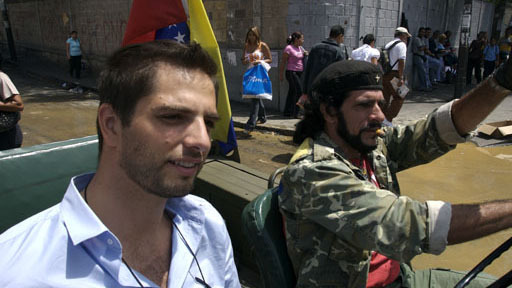 Diego received his bachelor’s degree from the Northwestern University (major: journalism; minor: politics) and then interned for various newspapers such as the Times Picayune in New Orleans, the San Francisco Examiner, the Saint Louis Post Dispatch, the Miami Herald and the Chicago Tribune before going to work for the Sun Sentinal as lead crime reporter. In 2000, he did his French military service in Bosnia and was stationed in Sarajevo—which led him to a specialization in “war reporting”. Back to France, he started working for the press agency CAPA as a war correspondent. He covered 9/11, the 2001 US intervention in Afghanistan, was embedded with the US Marine Corp in 2003 for a month as his unit traveled from Kuwait to Baghdad. After that he went on to follow the war in Eastern Congo, the 2004 tsunami in Banda Aceh, Indonesia, Yasser Arafat’s funeral in Ramallah and did a special report on the rise of Evangelical Christians in George Bush’s America, among some 50 other news stories. 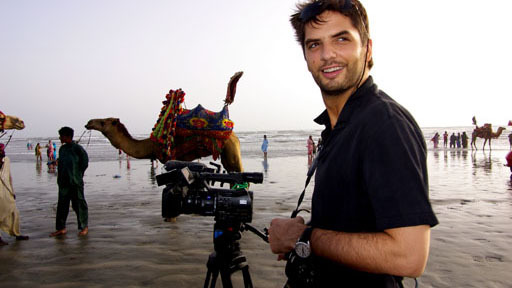 In 2006 he shot the first episode of the series Don’t Tell My Mother,co-produced by Canal+ and the National Geographic Channel, where he offers a new look on rarely traveled areas affected by conflicts and wars such as Afghanistan, Colombia, North Korea, Congo, Venezuela, Israel, Iran, Iraq, The Balkans (Croatia, Bosnia and Herzegovina, Serbia and Kosovo) and Pakistan. The episode in Pakistan is regularly blocked on national geographic channel in Pakistan and also been removed from YouTube. In 2008 Diego created his own production studio named, Explorer Productions. Have you seen this series? I know many of you like traveling,but do you watch any travel shows? Other than ‘Don’t Tell My Mother’, I watch No Reservations with Anthony Bourdain, Globe Trekker, Discovery Atlas and Samantha Brown shows (although this one I don’t watch that regularly).